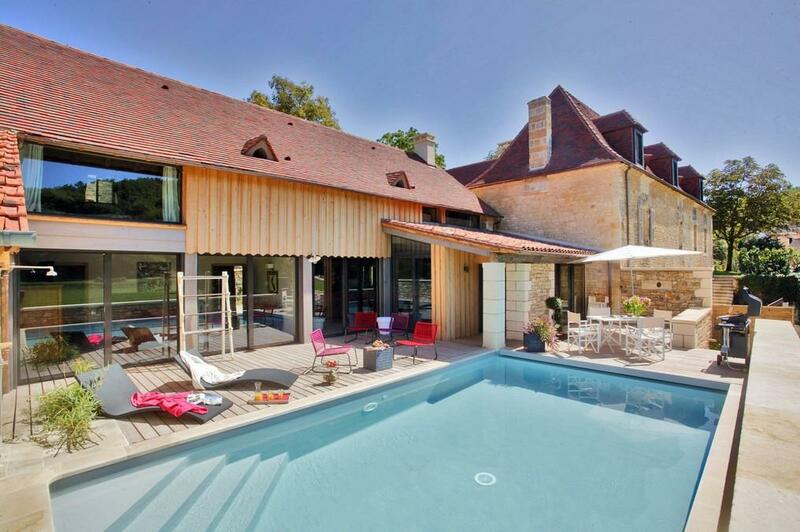 Lovers of old stones will adore this luxury house situated in the Périgord Noir. Three luxurious double bedrooms with en suite bathroom. Ground floor bedroom for people with reduced mobility. Private heated pool. Air conditioning in bedrooms, underfloor cooling downstairs. Located in peaceful village, one of the most beautiful spots in France. Only minutes from the breathtaking Lascaux caves. Hotel quality bedding, sheets and household linens provided. Additional services and staff (cook, massages ...) on request. One of three completely private and self-contained dwellings within the same parc. Lovers of old stones will appreciate the mix of authentic and modern in this 170 m2 property. The large bay windows overlooking the wooded valley, together with the spacious and bright rooms, make this house a haven of peace. Three beautiful bedrooms and en suite bathrooms with elegant decoration (TV and DVD player). Air conditioning upstairs and underfloor cooling on the ground floor. A magnificent panorama of the valley and the private parkland. A large wooden terrace overlooking the private, heated pool with secure electric cover. The house is a harmonious mix of traditional atmosphere and modern materials. It’s a perfect combination! Double bed 180 cm or single beds with 2 private bathrooms (bath or shower) with separate toilets. Additional services and staff (cook, cooking lessons, bike rental, tennis court, babysitting service, massages ...) on request. Please note: The Hermitage is situated on the same site as The Old Forge MTGC102 and The Spring House MTGC103. They are all completely independent with no overlooking, no common access, and each has its own private heated pool and parking. Saint Amand de Coly, Périgord Noir. Visit the Caves of Lascaux 4, the Grand Roc, the Madeleine, La Roque St Christophe, the Forte de Reignac house and a little further the Gouffre de Padirac. Stroll in the gardens of Eyrignac, Marqueyssac, Hautefort. Discover the little secret corners, St Geniès, St Léon sur Vézère . Admire the Châteaux of Puymartin, Losse, Commarque, Milandes, Beynac, Castelnaud; but also the village of Eyzies De Tayac, the world capital of prehistory with its unique troglodyte architecture. End of stay cleaning included. Extra maid service available at 50€ for two hours. Linen and bath and pool towels included. The Hermitage has been transformed into a 170 m2 house with exceptional charm. 3 luxurious double rooms - one of which, on the ground floor, is a fully-equipped room accessible for people with reduced mobility. Thank you for a wonderful stay, we really had a lovely time. The house is beautiful and perfectly equipped - it had everything we needed for a family stay. The location was great, remote enough to be peaceful but within easy reach of all we needed to visit and enjoy the region. We very much hope to come back again soon.